This work was financially supported by the ACT-C program (JPMJCR12YO) from JST and KAKENHI (17H03025, JP18K14878, and 18H04276 in Precisely Designed Catalysts with Customized Scaffolding) from JSPS and MEXT. J.-S.Y. was supported by a JSPS International Research Fellowship. 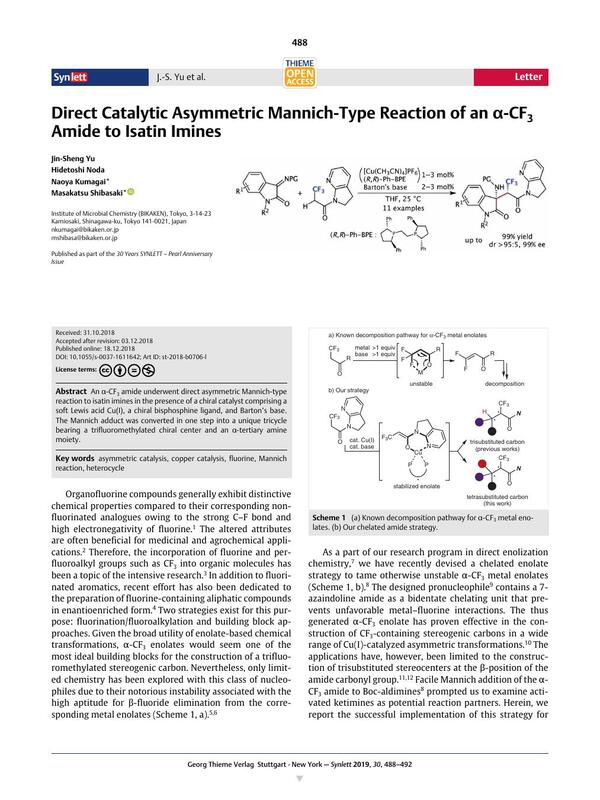 An α-CF3 amide underwent direct asymmetric Mannich-type reaction to isatin imines in the presence of a chiral catalyst comprising a soft Lewis acid Cu(I), a chiral bisphosphine ligand, and Barton’s base. The Mannich adduct was converted in one step into a unique tricycle bearing a trifluoromethylated chiral center and an α-tertiary amine moiety. Supporting information for this article is available online at https://doi.org/10.1055/s-0037-1611642. In Cu(I)-catalyzed aldol reactions, the reactivity of the α-CF3 enolate is somewhat lower than those with other substituents: While α-alkyl, vinyl, and N3 7-azaindoline amides smoothly undergo aldol additions to simple aldehydes, α-CF3 amide 2 only reacts with activated arylglyoxal hydrates. 16 See the Supporting Information for details. CCDC 1874483 contains the supplementary crystallographic data for 3e. The data can be obtained free of charge from The Cambridge Crystallographic Data Centre via www.ccdc.cam.ac.uk/getstructures. 17 With 1 mol% catalyst, 3a was obtained in 55% yield with the high selectivities retained (dr >95:5, 98% ee). 18 Compound 3a A flame-dried 30 mL flask equipped with a magnetic stirring bar and 3-way glass stopcock were charged with imine 1a (781 mg, 3.0 mmol, 1.0 equiv), and α-CF3 amide 2 (760 mg, 3.3 mmol, 1.1 equiv), followed by the addition of anhydrous THF (9.6 mL, 0.2 M) via syringe with a stainless steel needle under an Ar atmosphere. After being stirred at 25 °C for 5 min, a solution of the catalyst in THF (4.5 mL) containing a chiral copper(I) complex (0.090 mmol, 3.0 mol%), which was prepared from [Cu(CH3CN)4]PF6 (33.5 mg, 0.090 mmol) and (R,R)-Ph-BPE L8 (54.7 mg, 0.11 mmol, 3.6 mol%), and a solution of Barton’s base (0.1 M in THF, 0.90 mL, 0.09 mmol, 3.0 mol%) were sequentially added via a syringe with a stainless steel needle. After stirring at 25 °C for 12 h, the reaction mixture was filtered through a pad of silica gel and washed with EtOAc, then concentrated in vacuo to afford the crude residue. 1H NMR analysis of the crude residue showed that the dr was >95:5. The combined crude residue was then purified by silica gel column chromatography (5% to 80% EtOAc in hexane) to afford product 3a (1.46 g, 99% yield). IR (thin film): ν = 3371, 2943, 1721, 1653, 1426, 1256, 1164, 754 cm–1. 1H NMR (400 MHz, CDCl3): δ = 7.93–7.92 (m, 1 H), 7.51–7.49 (m, 1 H), 7.44 (d, J = 7.2 Hz, 1 H), 7.35–7.31 (m, 1 H), 7.08–7.04 (m, 2 H), 6.91 (dd, J = 7.6 Hz, 5.2 Hz, 1 H), 6.84 (d, J = 7.6 Hz, 1 H), 6.31 (q, J = 8.8 Hz, 1 H), 4.31–4.10 (m, 2 H), 3.15–2.99 (m, 2 H), 2.96 (s, 3 H), 1.20 (s, 9 H). 13C NMR (100 MHz, CDCl3): δ = 174.6, 163.4, 154.8, 153.8, 145.2, 143.2, 134.3, 129.3, 127.2, 126.8, 125.4 (d, J = 2.5 Hz), 124.3 (q, J = 281.1 Hz), 122.2, 119.0, 108.1, 80.0, 61.2, 48.9 (q, J = 26.1 Hz), 46.0, 27.9, 26.1, 23.7. 19F NMR (376 MHz, CDCl3): δ = –57.98 (d, J = 8.5 Hz). HRMS (ESI): m/z calcd for C24H25O4N4F3Na [M + Na]+: 513.1720; found: 513.1724. [α]D 24 –48.0 (c = 1.00, CHCl3). Enantiomeric excess of the product was determined to be 98% by chiral stationary phase HPLC analysis (CHIRALPAK AD-H (φ 0.46 cm × 25 cm), 2-propanol/n-hexane = 1:4, flow rate 1.0 mL/min, detection at 254 nm, t R = 5.9 min (major), 13.2 min (minor)). 19 The stereochemistry of 4 was assigned by NOE analysis. See the Supporting Information for details.